Melissa Lopez,Region One director during a press conference to announce several multi-million dollar GEAR UP grants by the U.S Dept. of Education on Tuesday, Oct.16, 2018. in Edinburg. 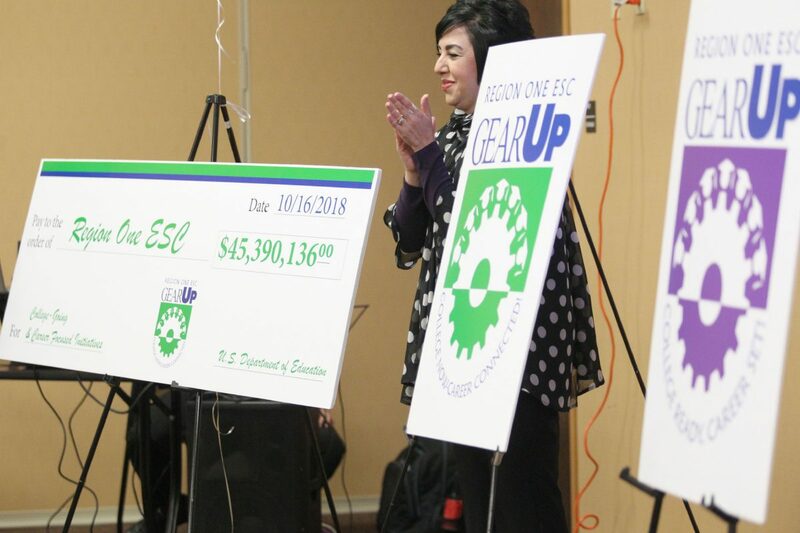 EDINBURG — After several failed attempts at getting federal funds renewed to push the area’s GEAR UP programs further, Region One Education Service Center announced it is not only approved this year for one award, but two totaling $77 million. The two awards will cover the entire Region One area, which encompasses seven counties, including the Rio Grande Valley, for the next seven years in efforts to further prepare and connect students to college and career paths. Region One held a news conference Tuesday morning to announce the awards, which was immediately followed by a meeting with representatives from the 29 participating school districts to discuss budgets and planning. 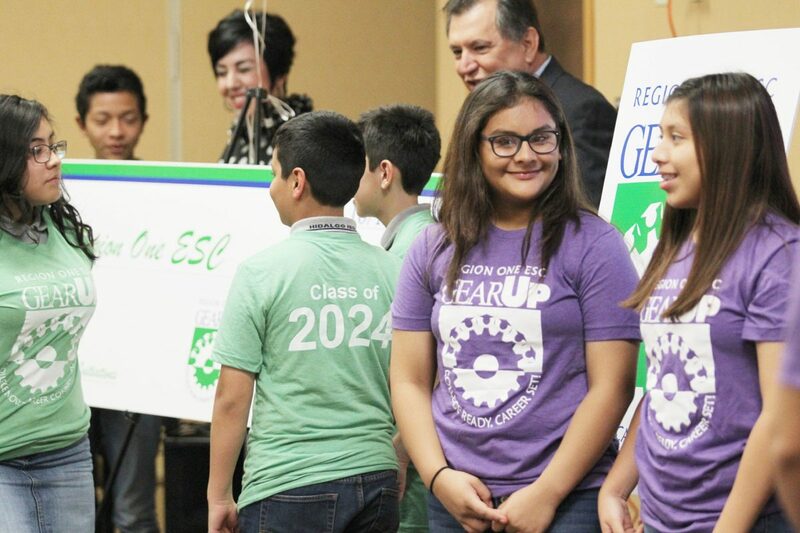 Middle school students from La Sara and Hidalgo school districts attend Region One press conference to announce the the multi-million dollar GEAR UP grants by the U.S Department of Education on Tuesday, Oct.16, 2018. in Edinburg. Middle school students from Hidalgo school district attend Region One press conference to announce the the multi-million dollar GEAR UP grants by the U.S Department of Education on Tuesday, Oct.16, 2018. in Edinburg. GEAR UP awards aim to provide mainly middle school and high school students with additional funding and resources such as counselors that focus solely in providing students exposure to colleges, degrees and careers. These grants have remained in the region through other awardees such as the University of Texas Rio Grande Valley, which received over $3 million in 2017, and Vanguard Academy, which received funding yet to be disclosed this year. At Region One, the funding came for two separate programs: Gear Up College Ready, Career Set, funded at nearly $31.6 million and which aims to expose students to both career and college-bound pathways; and the College Now, Career Connected program, which is funded $45.4 million and caters to the Early College High School model to expand offerings of rigorous coursework, preparation for college-readiness exams and dual enrollment programs. The College Ready, Career Set program is set to be offered at 17 school districts, 25 middle schools and 17 high schools throughout the region. The College Now, Career Connected program will be available at 12 school districts, 30 middle schools and 18 high schools. These added resources are set to impact all students enrolled in participating campuses and are set to kick off immediately and continue over the life of the grants. Districts will be able to tailor the funding to their needs so long as these match the guidelines of the program, Lopez said. Some might choose to use the money for new hires if needed, while others might use it to renew contracts of GEAR UP counselors previously hired. The grant will also allow Region One more staff of their own to help service each partnering district. Lopez said she estimates the funds to allow for about 55 new hires, who would work as facilitators or counselors for the program. One change in the focus of these new grants and staff from previous years will be in added emphasis on career pathways rather than college only, Lopez said.